I wanted to come back with an optimistic piece of news. It hasn’t been easy, and I won’t hesitate in using it as an excuse for my lately laziness. However, I found it and here it is. Finally I have seen a change in the horizon in my school of architecture in Barcelona. There have been debates, demonstration, strikes, and a long list of other actions and activities going on in the school during this past semester, all of which stopped a month before finals, as it’s starting to be usual. Nevertheless, I am starting to see changes that are, most certainly, fruit of these past, at first only confusing, events. 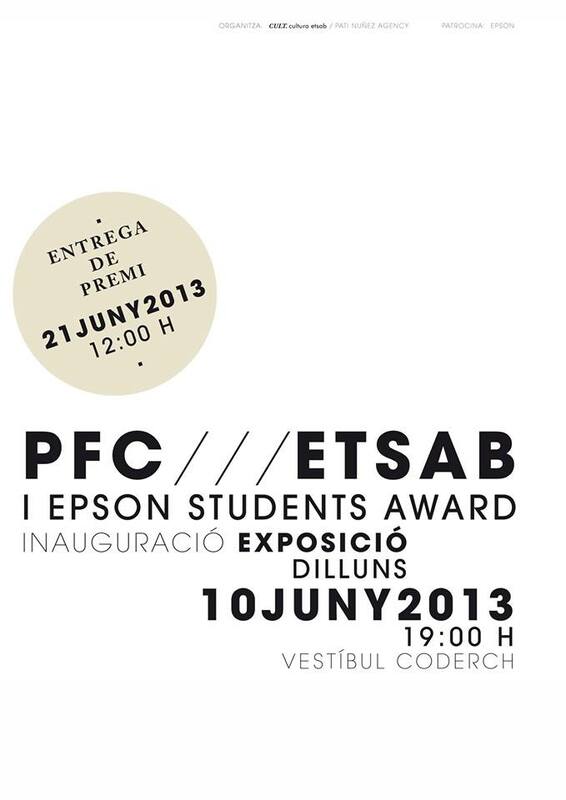 An exhibition of final projects is having place at my school, free for everybody to see, an admire if possible, what the students of the ETSAB have to present in order to get their license. No an easy task, and very good projects come out of it. What better way of honoring the best students that by showing to the world their work. If this continued to happen I am sure more people would make a bigger effort. Everybody loves being given credit for hard work. But, there is always a but, this exhibition has been organized by Epson, a private company whose criteria was not only outstanding architecture, but also eye catching images. We live in a visual world, hard to fight against that, right? 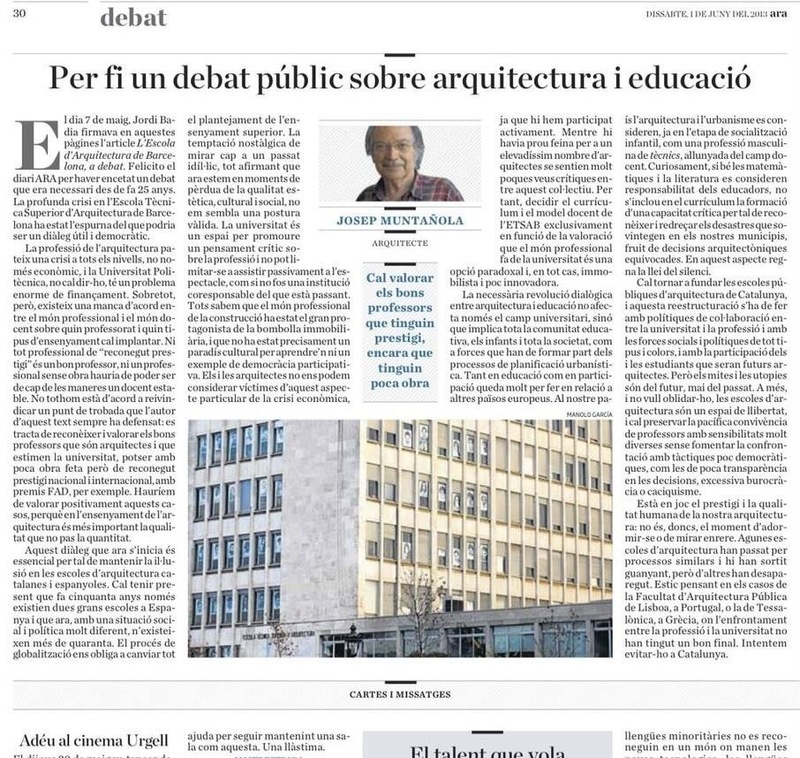 The second piece of news that I am proud about is the article written by Josep Muntañola, a professor at ETSAB, who encourages everybody to think architecture as not only a matter of those who already are architects, but as a problem that affects even the smaller kids. Unfortunately I don’t entirely agree with everything he wirtes, but the general outline is positive. He points out that our school has been living of past glory for the last 25 years or so, that professors are not always chosen by their education skills, but by their long list of awards, and that, in some cases, doesn’t help the student. He also animates us not to complain but to propose new ideas, more or less what the activities in the last month had tried. But, he himself, as a professor, is blinded in some specific points. One of the issues that our school faces is good quality versus creativity freedom. I am not going to deny that the level of the projects that come out of our school are, in the majority, very good. “Perfection” requires sacrifices, and our school sets some rules very tight the first three years of its program, making sure nobody’s project goes crazy and therefore problematic. If we want society to perceive architecture in a better way, we, architects and architecture students, have to give a damn and take care of it from the start. Involving kinder garden teachers and Josep Muntañola suggests is as a beautiful idea as it is a foolish one. Why don’t we start, as I think we all agree, by setting new rules for what the education of architecture might be? More freedom, no whimsical craziness, and more fun are what I think would be the most important aspects to take into account. Let’s have a Spanish NOWNESS.